Basil tops the list of must-grow culinary herbs for summer and it is not hard to find 10 good reasons to grow it! For a start there are at least 10 different varieties of basil and each has something to recommend it. The two top culinary varieties are Sweet basil and Basil “Genovese”. Sweet basil (Ocimumbasilicum) has large green soft leaves and is the most popular variety to use fresh or in cooking. It pairs well with most vegetables, especially tomatoes, aubergine, sweet peppers and zucchini. It is the secret ingredient of delicious tomato based sauces, particularly those for pasta, and can also be used in salads, and to flavour egg dishes, salads, chicken, fish, veal and pork. “Genovese” is the “pesto” basil, having large, soft, tasty leaves. Traditional pesto is a combination of basil, olive oil, pine-nuts, garlic and parmesan cheese. There are many ways in which an imaginative cook can use it. The beautiful basils are Opal Basil, and ‘Red Rubin”. Both have large, dark purple leaves and are feature plants in the garden. The leaves can be used fresh, in cooking or in herbal vinegars. There is also the green and purple “Ruffles” that has large serrated leaves. These add an interesting texture and colour to salads and as a garnish. The novelty basils are the lemon and cinnamon flavoured basils, Greek and bush basils that have small leaves with an intense taste and Thai basil “Siam Queen’. This is a neat, upright plant with medium sized leaves and beautiful clusters of purple flowers. All these annual varieties grow to a garden height of 80cm and spread of 50cm. The two perennial varieties are Greek Columnar basil and Pink Perennial Basil. They are not frost hardy and should be covered or planted in a container and moved to a more protected area. These varieties will give you basil flavour and fragrance in winter. They grow up to 1,5m high and one metre wide. Basil provides a constant supply of leaves from early summer through to the first frost. Basil that gets plenty of sun and is planted in soil that drains well quickly grows into a lush, well branched bush. It is an excellent companion plant for tomatoes and, in fact, all plants benefit from its insect repellent properties. Use the leaves to make a home-made spray to deter aphids, flies and termites. Bring four cups of water to the boil, add one cup of fresh basil. Cover the pot, remove from the heat and cool. Strain and mix with a very small amount of liquid dishwashing soap and spritz onto insect infested plants. Basil flowers attract pollinators, especially bees and butterflies, especially perennial basil. Don’t let culinary varieties flower until the end of the season. Removing the flower heads encourages leaf growth and produces a bushier plant. The leaves are intensely perfumed and just smelling them is enough to lift the spirits. That is because basil has a gentle sedative action that helps to relieve insomnia, anxiety and mild depression. A fresh infusion added to bathwater is very invigorating. A few leaves steeped in wine for a few hours can be drunk as a tonic. Two to three cups of basil tea a day can help improve digestion and act against bacterial infections and intestinal parasites. 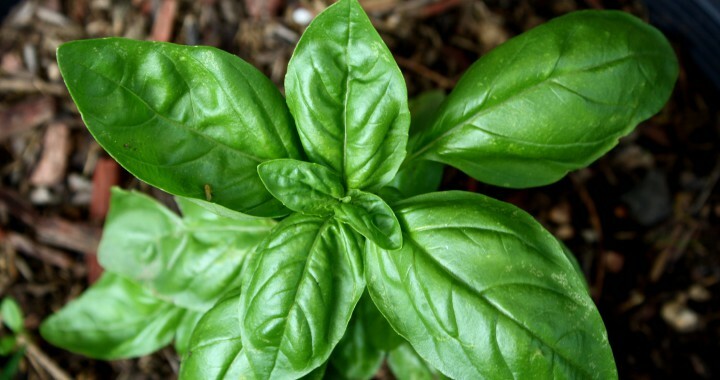 As a beauty herb, basil is an astringent deep cleanser for oily skins. Add it to the boiling water when steaming your face. A strong infusion combined with honey is an effective cough syrup and can also be taken for colds. The antiseptic properties of basil leaves helps to heal and relieve itching when rubbed on insect bites and stings. It will also help to alleviate acne and skin infections. Add basil leaves to pot pourri. Basil has only two dislikes. It should not be planted anywhere near rue and it doesn’t like consistently wet soil that doesn’t drain well. Black spots on the leaves or around the edges of the leaves are signs of its unhappiness. Posted in Growing Herbs and tagged basil, falvour, herb, medicinal.